ILYVM | What Does ILYVM Mean? 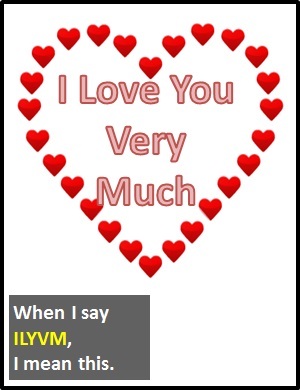 ILYVM means "I Love You Very Much". ILYVM is a sincere way of telling someone you love them. It is not considered playful. ILYVM carries a traditional, sensible sentiment. I love you very much (ILYVM) is something lovers say to each other. Person A: Darling, ILYVM. Will you marry me? Person B: I thought you'd never ask. Yes, yes, of course. Person A: It's great that we get on so well and love the same things. ILYVM. Person B: Yes, I love you very much too. Now, please pass me that spanner. ILYVM is a declarative sentence (i.e., a statement). In other words, it is not used as a part of speech in a wider sentence. Of note, ILYVM is an initialism abbreviation. Technically, this means it is pronounced using its individual letters (i.e., Aye El Wye Vee Em), but as this is harder to say than "I love you very much," it is not often uttered using its letters. In other words, the abbreviation ILYVM is for efficiency in writing and not efficiency in speech.